SBI 2 template for Easy Blogs. This is a generic for all SBI transition templates to 3 column. I used my own style.css and images to make the template look good, and added the Easy Blogs menu system. Notice the top, left side and bottom menus actually work. Automatic menu compilation reduces the amount of work needed to add or substract items from the menu. Multiple variations to menu structure available inside Easy Blogs. Create home, article, hidden or static pages. Easy to use HTML editor builds your pages and inserts html code with point and click ease. Quickly add links using the link tool. Simply specify where the link is stored. Select whether it opens a new window or not. HTML code is automatically generated and inserted into your blog entry editor. See The Tutorial. All entries are permalinked and archived no matter what type of content you enter. You get eight types of content articles, blog posts, category pages, static pages, hidden pages, redirect pages, recent entries pages and free form pages. This allows for special situations like thank you pages and other hidden pages that you don't want published. SBI 2 template for Easy Blogs generates xml files for Rss or Really Simple Syndication. Learn how to create up to 100 xml files (blogs) in Easy Blogs in the SBI Rss Software And Tutorial. Easy Blogs (EB) generated web pages will always pass the xml validation process necessary to get syndicated. EB comes with simple to use syndication applications that help you publish fast. Use this template to transition your SBI block built template to the new css driven 3 column template. Simply change the style.css file to your own. 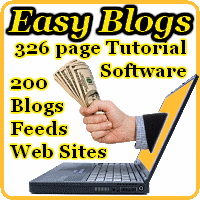 Easy Blogs is a plug and play platform. You design your SBI 2 template in the "template" editor and plug it into your blog using the "options" function. The new sbi 2 template uses div tags instead of tables. Each section of the template is addressed in the css file. That means when you change your look and feel, size or style all you need to do is re-upload your css file. In this way you can change your whole site in one fell swoop. No need to worry about re-uploading every page. Editing your content is a breeze in the "blog entry" html editor. Simple point and click buttons do most of the heavy lifting. Create tables, numbered or ordered list, or insert files, images and links all from a menu bar. SBI Rss Tutorial. Special features of this template include many of SBI's popular plug ins, like auto-dicovery code, SOCIALIZEIT and Rss feeds. 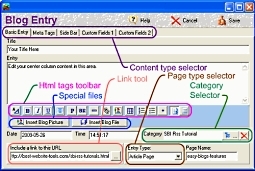 Easy Blogs content management system is second to none. Because EB is a stand lone software that resides on your computer means that all your files are stored on your computer. Neatly organized files saves you time when your looking for the specific file. Easy Blogs has a back up function that you can use to save your work. This allows you to easily copy all your work to a back up storage device on or off your computer. Build your whole website or 100 of them. Easy Blogs allows you to create 100 xml files. That means you can use this software to create up to 100 blogs or websites. 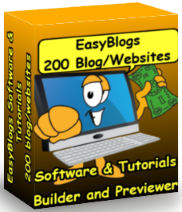 Easy Blogs software. Downloads to your computer so you can design and build offline before you load to the Internet. How to set up your blog for maximum efficiency (read traffic). How to create and publish your rss.xml file. Choice of over 50 different templates including this one.